Sketch plugin that helps you get your design files as clean as a whistle. SketchCleaner is created to speed up Layer organization and (re)naming chores and smoothen developer/fellow designer/client handoff. If you're going for ultra clean Sketch design files you gotta do it right. Use SketchCleaner to get rid of Layer styles that are checked off and not actively used. (Final) design files are no place for hidden and often unused layers. 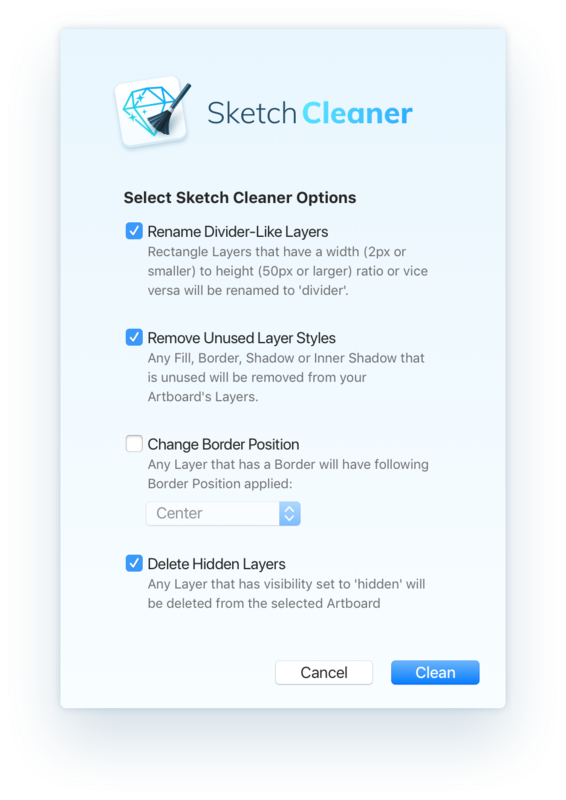 SketchCleaner lets you select all hidden layers at once for you to batch delete them. Inconsistent border positions affects (perceived) border radii and margins. Use SketchCleaner to maintain consistent border position across all layers with borders. Layer groups that contain mask content need to be expanded in order to know their contents are masked. Easily rename those Layer Groups in a logical way. Use SketchCleaners automator to execute four of the most powerful features all at the same time. Perfect for cleaning in hindsight. Unused bitmaps clutter your layers-panel can unnessarily weigh on your file size. SketchCleaner searches your file for bitmaps and selects them for easy reviewing. SketchCleaner helps you make sense of your Layer order again by letting you sort a selection of Layers based on either their x or y position on the canvas. We’re a design studio from Amsterdam. We help startups and businesses to refine, design and launch their digital products.